The Ellis James Designs Tall Cosmetic bag gives you huge capacity, with a size inspired by our very own customer requests! 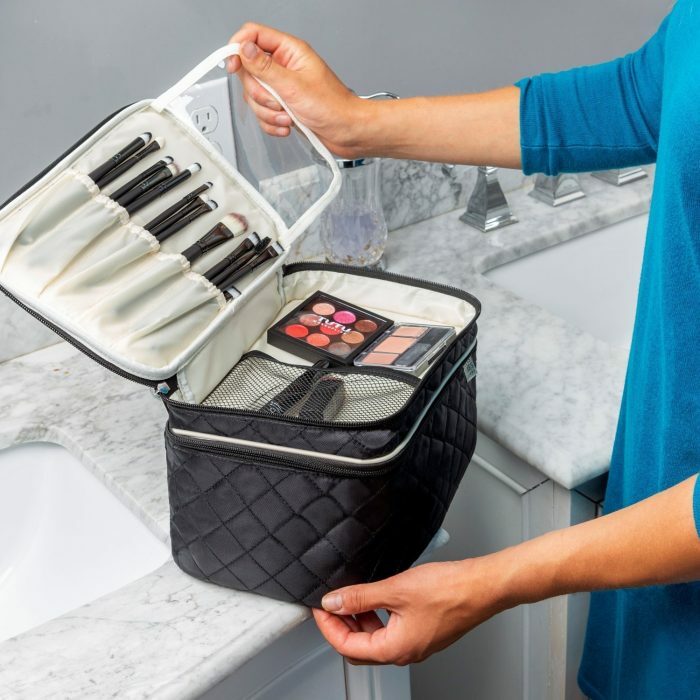 With elegantly designed makeup brush & tool holders, a large zipped pocket, and elasticated pouches for beauty essentials – You can use your bag however YOU want. The top brush compartment has been designed to keep your brushes clean and separate from the rest of your makeup. 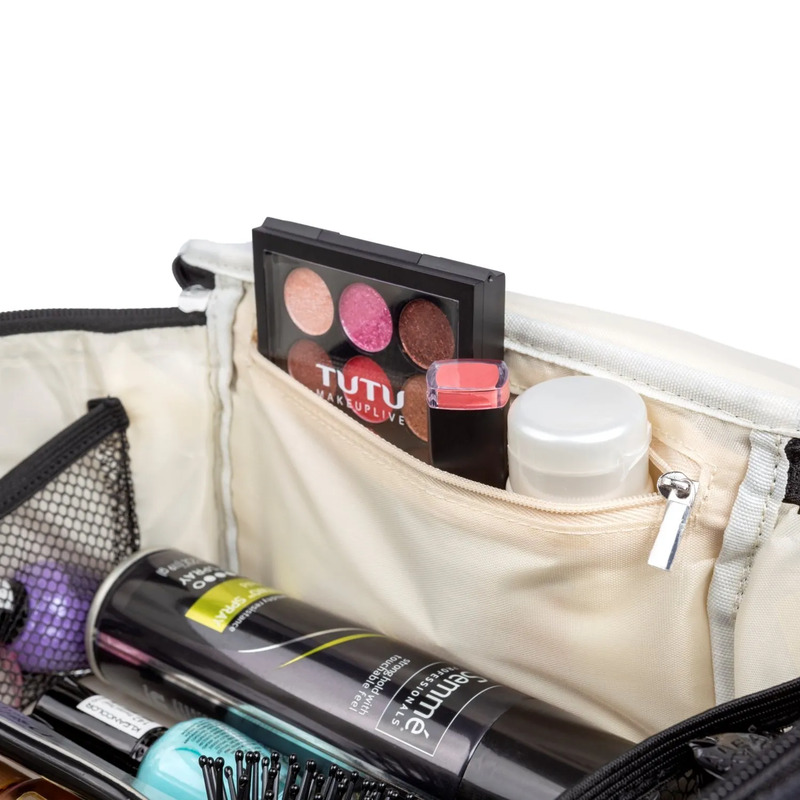 The large main compartment is the perfect setting for all your makeup, skincare, hair care, toiletries and bottles standing up! 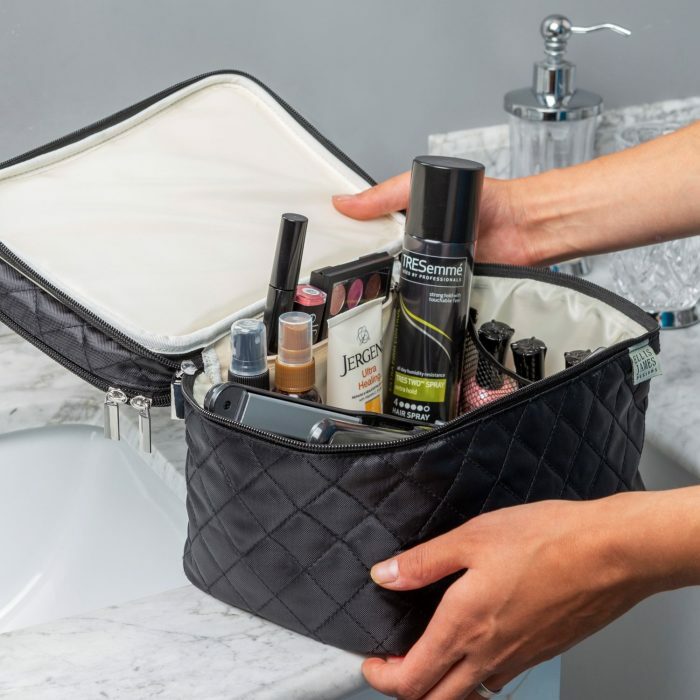 The elegantly designed quilted exterior is water-resistant and padded for protection, always keeping beauty products and tools safe. This is the new tall cosmetic organizer bag from Ellis James Designs that I wanted to try. I have the original cosmetic organizer bag and love it so much I wanted to give this one a spin as well. I loved the idea of being able to put my eyeshadow palettes, blush palettes and brushes in the top part of the bag and all the stand up bottles and things in the bottom part of the bag. I didn’t realize how much I would love having this option and I have only been using it daily at home. I love how it keeps me organized a little bit better with the separate compartments. This makeup organizer bag is a little taller and not as wide as the other makeup organizer which is why it allows for taller bottles like foundations bottles to stand up if you want them to. I love that it is compact but holds the same amount of items as the other organizer. I also love the addition of the clear flap they put in to cover the brushes in the top portion. It keeps them separate from all the other things in the bag so no getting things dirty! This is something I knew I was going to love! There are two mesh pockets and a zip pocket in the main section of the bag. These come in very handy for those small items like eyeliner, smaller brushes, lip stick etc. Really anything that is small and usually just floats around in the bag. The two side mesh pockets make it very convenient for just grabbing what you need and eliminated the digging around that I am so use to doing! I love this makeup bag. I needed a replacement after both zippers broke off my old one. This one is good quality and zippers seem like they’ll last. It’s bigger than I expected it to be which is fine, I just didnt want it to be too small. I love that it has separate sections and also a place for a few brushes. This is a really nice makeup case. I use it to take with me when I go places and don’t need to take all my makeup in my huge case. I def recommended this for storing or carrying makeup around in. I absolutely love my Ellis James Tall Bag. It carries everything I need in it, and keeps me super organized. My favorite part about this bag is that it has so many different compartments to organize different things. The brush organizer has been a lifesaver for me, as I always feel like I have brushes just thrown all over the place. This bag is a must have if you need help with organizing your makeup collection, whether its big or small. I can fit well over a full face of makeup in my bag with no problems. You need this bag like yesterday! I love everything about these travel bags and continue to purchase more and more over time. They are insanely practical without sacrificing on style. This one holds bottles up to 4 1/2 inches high without issue, and the side pockets are tall enough to handle both standard and stiletto lipstick tubes. I use this bag when I am bringing a wider selection of makeup, brushes, and beauty items, and Ellis James’ combined jewelry/makeup bag for quick jaunts. The spinner suitcase in the back is a super small 18” one, so just be aware that the travel case looks larger than it would in relation to a 24” or bigger suitcase.